The CitationJet departed Burlington (BTV) around 14:45 on a routine flight to Atlantic City (AIY). The pilot first made a low pass down runway 29 and then return to land on runway 11. After touchdown the airplane failed to stop and overran the runway and into the Intercoastal Waterway. The occupants were rescued by a boat. According to the Cessna 525A Landing Distance Chart, an airplane with a landing weight of 11,000 pounds required 2,930 feet of landing distance, in a no wind situation. With a 10 knot tailwind, which was the approx wind at the time of the accident, the airplane required 3,500 feet of landing distance. Runway 11 at Bader Field is a 2,948 foot-long, 100 foot-wide, asphalt runway. Bader Field is normally closed to jet traffic. PROBABLE CAUSE: "The pilot's improper decision to plan a flight to a runway of insufficient length, his improper in-flight decision to land on that inadequate runway with a tailwind, and his failure to obtain the proper touchdown point. 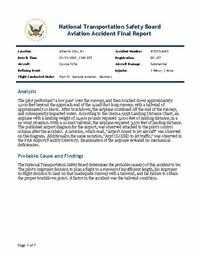 A factor in the accident was the tailwind condition." Distance from Burlington International Airport, VT to Atlantic City-Bader Field, NJ as the crow flies is 574 km (359 miles).